Want to participate in the Lucy Maud Montgomery Reading Challenge but don't know where to begin? Never read Anne and seriously need to correct this reading flaw? Walla! I have an extremely and very gently used copy to give away to one of you. If you would like to win, simply leave a comment below. I will hold this contest open through Sunday, December 27th so that we can find out what might be hidden under Christmas trees. Go ahead and leave a comment though and if you win and already received the book, I'll just pick another winner. But at this rate, I'll have a week to get the book to you in time for you to participate in the L.M. Montgomery Reading Challenge! Consider me a woman on a mission to change and save the reading world, one person at a time. Seriously. If you haven't read Anne leave a comment. This is the best I can do at forcing you to make a new friend. Thanks for the Christmas book suggestions, Carrie! I have never read any of the Anne of Green Gables books. Seriously! My girls and I love Anne but do not own a copy. Wonderful books! Such a great book for child and woman! So delightful!!! Don't enter me. Can you believe I have never read this book...please count me in this classic giveaway...thanks. I LOVE the Anne movie series but for some reason have never read the books. I would love to win so I could read it. Thanks for the giveaway. I have read it, so don't enter me, but as you know, I only just read it last year for the first time (as did Amanda), and we are SO VERY glad we did. I have to admit I've read the series - and own the series... Though I know some nieces who'd love their own copy! I LOVE Anne! I grew up on the movies, but have never read the books! Thanks for the giveaway! While I was pregnant I listened to the first book on CD, but would love to actually read the book for once myself. Listening just isn't the same. I would love to read this book myself and aloud to my children. Would love to own this classic. I'm from Brazil and I saw your link in Winning Readings blog. I'll add you in my read list. 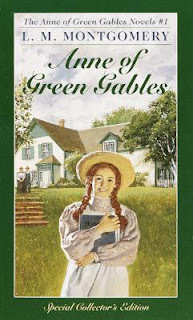 "Ann Of Green Gables" seems to be a great and beautiful book. A friend already comment about this, but I didn't read still. Here in Brazil, it was published this year. Can I enter in this drawing?